Countries in the Western Balkans are at a crucial junction, called to innovate and adapt to a new environment while still dealing with the legacy of the past and the need to complete the transition to modern market economies. 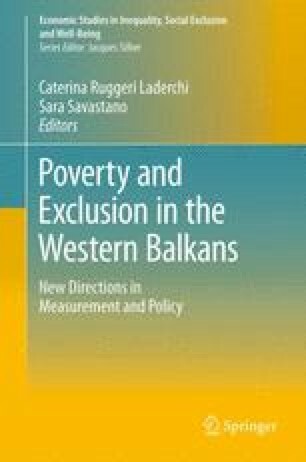 This book looks at this junction from the special lens of the poverty and exclusion agenda, though its overarching theme is of broader application. New resources and tools are available, and a lot of innovation is occurring in both measurement and policy design. Yet, in this as in other domains, the transition to a new way of doing things needs to build on a careful assessment of local realities. As for several of these countries the prospects of EU accession are becoming closer, there is a temptation to adopt models that have been developed for other contexts without questioning whether all the supporting elements for those models to be effective are in place. Grounding the decisions on how to move forward in rigorous analysis of what different approaches and tools contribute to our understanding of poverty and exclusion, and sharing experiences and learning from others will strengthen the effectiveness of the decisions taken as the region’s poverty and exclusion agenda become more aligned with EU priorities. The findings, interpretations, and conclusions expressed in this chapter are those of the authors and do not necessarily reflect the views of the International Bank for Reconstruction and Development/the World Bank and its affiliated organizations, or those of the executive directors of the World Bank or the governments they represent. The World Bank does not guarantee the accuracy of the data included in this work.